So, after coming home from Stark-Vegas, Alabama plays Louisiana-Monroe as a warm up for the Iron Bowl against Auburn. The 2007 edition of the Iron Bowl will be played at Jordan-Hare Stadium. This game should be a fairly crazy one with not only the addition of Nick Saban, but also the fact that the game will be held on Thanksgiving Weekend. Hopefully, this one will go our way. The first settlers arrived in the winter of 1836 from Harris County, Georgia. They intended to build a town that would be the religious and educational center for the newly settled area. In 1856, the state legislature chartered a Methodist college, the East Alabama Male College in Auburn. This college, now Auburn University, opened its doors in 1859. The college was turned over to the state in 1872, and was renamed Alabama Agricultural and Mechanical College with a new mission as a land grant college. After the U.S.A. entered World War II, Auburn’s campus was turned into a training ground for technical specialists in the U.S armed forces. After the war, Auburn was filled with soldiers returning to school on the G.I. Bill. Auburn began a period of growth that lasted through the 1950s and 1960s due to this increase of students. Construction of Interstate 85, beginning in 1957, connected Auburn to the major cities of the state. This allowed for Auburn University (renamed in 1960) to schedule more home football games in Auburn rather than in larger cities around the state. This created the strong tourism component in Auburn’s economy. If you want to enjoy the great outdoors with the family, a visit to Chewacla State Park. The park facilities include a 26-acre lake, swimming area, playgrounds, hiking trails, a modern campground and picnic areas with tables, grills and shelters. There are entrance fees, but the prices are relatively low. Golf enthusiasts should check out Grand National on the Robert Trent Jones Trail, if you haven’t already. I know this isn’t what you might view as the first place to visit during Iron Bowl weekend, but I do think it is a good place to check out no matter, game or no game. I’ve been told many times that this is one of the better courses on the RTJ Trail. For those of you who are looking for a place to visit close to the campus, Toomer’s Drugstore, located on (you guessed it) Toomer’s Corner. This is Auburn’s best known location, where they roll everything in site after a win. They are also famous for their lemonade and ice-cream fountain drinks. The Tiger Trail might interest some people. It is a walk of fame that goes through campus and downtown. It honors past students, athletes, and coaches. I know many of you aren’t Auburn fans, it is probably a good tour through the campus and Downtown Auburn. If you are looking to eat at a popular Auburn landmark, try Mama Goldberg’s Deli on the corner of Magnolia Road and Donahue Drive. This run-down shack conceals some of the best sandwiches in town. A few of my Auburn friends suggest “Momma’s Love all the way,” which is a sandwich naturally. Pizza lovers will be very happy after they visit the Brick Oven Pizza Company on Gay Street. Not only is the pizza good, but they serve beer and wine as well. Eat on the patio if the weather is nice. Formerly a restaurant called The Hungry Hunter, The Highlands is now one of the largest bars in town. This place doesn’t have as much of a college atmosphere as other bars in town, but it still does pretty well. They provide live music and are located on Opelika Highway between Dean Road and Shug Jordan Parkway. Also under the same ownership as The Highlands, SkyBar Cafe is a fairly new and popular spot. The bar attracts the younger crowd, although older students enjoy it as well. They also provide live music and are located on Magnolia near College Street in downtown Auburn. Many consider The War Eagle Supper Club to be an Auburn classic. Supper Club is a different kind of place. It draws all crowds and all ages, and is unrivaled for great live music. Supper Club is a “private” bar, so you’ll have to wait in line for a membership card on your first visit. However, that membership gives you the ability to drink until 4am, so often the crowd shows up around 2am, when the downtown bars shut down. I’m guessing that this place is pretty big on the Auburn Tigers based on their names. Ariccia Italian Trattoria & Bar is an upscale Italian restaurant located in the Auburn University Hotel and Conference Center on College Street at Thach Avenue. Ariccia is named after the ancient town of Ariccia, Italy. It is a bit pricey, but I’ve been told it is a great place to take a date. Other than an unlikely SEC Championship Game and possible Bowl, this is the end of my Bama Roadtrip series. I know I didn’t hit all of the popular places in every city, so feel free to do some investigating of your own. I hope this has proven to be helpful for you. For now, use this video to help you deal with the anticipation of 2007 Alabama football. Roll Tide. After the game verses Ole Miss, Alabama has two home games against Tennessee and LSU. Following those two home games, the Tide travels over to Starkville, Mississippi to play the Mississippi State Bulldogs. We all remember the loss to State that basically ended Mike Shula’s career. The best way to thank them for that is to, well….. beat them horribly. Settlers were drawn to the Starkville area because of two large springs. A mill southwest of town provide clapboards which gave the town its original name, Boardtown. In 1835, Boardtown was established as the county seat of Oktibbeha County and its name was changed to Starkville in honor of Revolutionary War hero General John Stark. After the 2000 census, the city population was said to be 21,869. Mississippi State University has been spending some money recently to improve the visual quality of their campus. This includes starting a new tradition, The Junction (see a picture HERE). It is named by the students, and gives tribute to the university’s past connection to the railway that used go through that location. I wonder if it is a response to hearing so much from Ole Miss fans about The Grove. This is probably the best place for tailgating now, but there are plenty of regulations to follow. Another new addition for MSU is the Barnes & Noble bookstore, which is in the Cullis-Wade Depot. This complex is right next to the football stadium, so you won’t be too far from tailgating. You can find snacks, Starbucks coffee, and most anything else you would want in a college bookstore. If you want a souvenir that can fill you stomach, try the MSU Cheese Store (The MAFES Sales Store). I had a neighbor bring my family a ball of Edam cheese one Christmas… I’ve been wanting to get some ever since. They also serve peanuts and juices, which I have not had a chance to try yet. Their wide variety of products should please most customers. The store is located in the glass annex at the front of the Herzer Food Science Building on Stone Boulevard, about 300 yards south of Scott Field. If you want some BBQ, try The Little Dooey, a Starkville favorite. They serve Hickory-smoked sausages, chicken, catfish, and ribs (smoked, rubbed, battered twice, then fried and served with tomato-based sauce). Lee Corso seemed to love this place…. I’m not sure what that means. Some people consider Sonny’s Barbecue to be Starkville’s best kept secret. I cannot find a website, but I do know that they are located on 16th Section Road. The only problem is that this place has closed its doors temporarily. Maybe they’ll be open by October. If you want a good burger than you can get in Starkville and Tuscaloosa, try Mugshot’s Grill & Bar. If you can eat the Mugshot on location in the given time limit, you get your meal for free. Another good place to visit for the nightlife is The Veranda. They serve both lunch and dinner. They also have one of the more popular nightclubs in Starkville, the Dawghouse Lounge at The Veranda. If you like New Orleans style food, try Oby’s. They have four locations around the state of Mississippi, with the original location in Starkville. They’ve been around for a long time, so most people from the area should know this place if you need to ask. They claim to have a quick casual style, which is probably a good thing for visitors. If you want a list of more places to eat, CLICK HERE. After the game against the Bulldogs, Alabama comes home to play Louisiana-Monroe. That game will likely be over by halftime, giving us a chance to rest our guys . The next road trip is the biggest game of the year… THE IRON BOWL! With the 5 game losing streak, Nick Saban, and conspiracy theorist Auburn fans put together, this game will be full of storylines. The Tide vs. The Tigers, should be fun. Please stay tuned for my preview of Auburn, Alabama. That will be the end of my Bama Roadtrip series. Roll Tide. So far, we’ve had two road trips up to this point. After the FSU game, Alabama comes home to play Homecoming against Houston. After Homecoming, The Crimson Tide travels to Oxford, Mississippi to play the Ole Miss Rebels. Oxford is a MUCH different place than Nashville and Jacksonville. I’m not expecting as many people to spend the whole weekend in Oxford, so this edition of the road trip guide is going to be a little bit different. The City of Oxford is located in Lafayette County in the north central portion of Mississippi. It is estimated that the current (2007) population is 19,000. Oxford was first incorporated as a town in 1837, and was given its name after the town of Oxford, England in the hopes of securing Mississippi’s first university. They were successful in their goals, with The University of Mississippi opening its doors in 1848. Famous alumni/citizens include John Grisham and William Faulkner. Obviously, The University of Mississippi is the place to be on gameday. I always like to get a look at the different campuses when I can. Ole Miss is in a traditional southern style town, so expect a little bit of the old south feel. The best known place for tailgating in the SEC, if not the country, is ‘The Grove.’ An Ole Miss tradition for ages, the Grove is one of the most scenic tailgating hot spots you’ll ever come across. But don’t expect being able to come and do as you wish, the Grove Society has set up plenty of rules to preserve the Grove. If you aren’t planning on tailgating, but still would like to eat in Oxford, you do have plenty of options. I’m posting as many as possible so you can have plenty of places to consider in a smaller town filled with plenty of fans and traffic. One one the best places for breakfast in Oxford is The Beacon Restaurant on North Lamar Boulevard. They open at 6 am on Saturdays. They seem to have good food at reasonable prices. I hear that there is a back room for ‘deals’, but I don’t know if that is true or not. It is An Oxford institution. If you’re looking for a restaurant with a good location that is also pleasent, try the Downtown Grill. The food is rumored to be good, but I’m not sure if it is the best in town. Their Dinner menu is little on the expensive side as well. If you’re looking for a good meat and three place for lunch, try the Ajax Diner. It is located on the Courthouse Square, which seems to be a great location in a smaller college town. If you want a good pull-pork sandwhich, there is always Handy Andy Grocery & Market BBQ. You basically order, get a number, and wait until they call you up. It could take a while if crowded. If you want to get outside of Oxford, try the Yocona River Inn. It is about 8 miles southeast out of town in Yocona. The prices are higher than you might expect, but the food is supposedly pretty good. City Gorcery seems to be very popular in Oxford. I cannot find a solid link for anything involving the place, but it does seem to be pretty popular based on word of mouth. They have a wide variety of food (Italian, French, etc). If you want a bar, try Proud Larry’s. They seem to be fairly popular based on the sites I’ve found. They do provide plenty of live music throughout the year. After this game, Alabama comes home to play against Tennessee and LSU. Enjoy your trip! After traveling to Nashville, The Crimson Tide has two homes games in a row against Arkansas and Georgia. After that, it is on to Jacksonville, Florida to play Florida State. I’ve never been to J-ville, so my suggestions will be based on what I find after about 2 hours of Googling Jacksonville. Jacksonville has a metropolitan population of more than 1.3 million. The city is centered on the banks of the St. Johns River, which flows into the Atlantic Ocean. The settlement that became Jacksonville was founded in 1791 as Cowford, because of its location at a narrow point in the river across which cattle were once driven. The city was renamed in 1822 for Andrew Jackson. 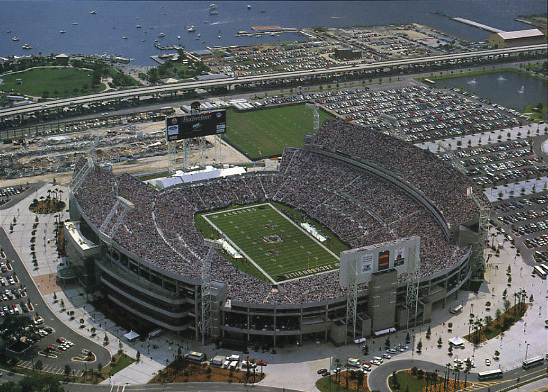 Jacksonville is also the home of the Jacksonville Jaguars, who play in Alltel Stadium. One place that is right next to Alltel Stadium is Metropolitan Park. This is a beautiful place with a public docking space, playground, picnic areas, landscaped gardens and riverfront walk. I get the feeling that this could be prime tailgating real estate (if tailgating is allowed there that is). It stays open from 7 am to sunset. Another good place to visit is the Jacksonville Landing, a large place to shop, enjoy river-view dining, and find some nightlife. This place is very close to a lot of downtown J-ville hotels. And, it is on the north side of the river, which is the same side that the stadium is on. This is the biggest shopping and restaurant place you’ll find close to Alltel Stadium since it is the hub of the downtown entertainment district. There is some sort of Friendship Fountain across the river from the Landing. It is supposed to be one of the largest in the world… who knows? Last, but not least, The Beaches! This town is further away from the stadium than the other places, just to let you know. If you decide to not eat at Jacksonville Landing, there are other areas for those of you with different or more expensive tastes. The River City Brewing Company is a popular spot to visit. It is pretty much directly across the river from the Landing. Their food is a little on the expensive side. But, you could just sit on the patio and kick back a few drinks looking at the river scenery. Dinner starts around 2:30 pm, which is the same time the brewery opens. The lunch menu looks reasonably priced. Don’t worry, the beer doesn’t seem to be that expensive based on the websites I’ve seen. Another place that you might like is Biscottis, on St. Johns Avenue. This is further away from the stadium than that Brewing Company, but it is pretty highly rated. The dinner specials on the website doesn’t show any prices. I’m not sure what to think of that. The pizzas sound really good to me right now. The rest of the food pricing seems pretty reasonable. If you feel like going all out, try Morton’s, The Steakhouse on Riverplace Blvd. I personally wouldn’t go there since the average cost for 2 people is $170. But, the food looks amazing. Honestly, Jacksonville Landing seems to have a lot of different places to eat and enjoy some nightlife. If you’re cost conscious, the Landing is probably a good place to check out. Mongo’s looks interesting to me. They prepare anything you want on a 72″ flat hot grill. Also at the Jacksonville Landing is The Twisted Martini. If you want a martini bar with a patio and plenty of dancing, this is your place. They do serve food as well. So there you have it. After the Jacksonville game, Alabama will come home to play Houston for Homecoming. After that, Alabama goes on the road again to play Ole Miss in Oxford, Mississippi. expect a different kind of tour guide for Oxford, Starkville, and Auburn. You’ll get a college town feel in these areas. Until next time…. I see many of my fellow bloggers giving great breakdowns of either the 2007 Alabama team, our SEC opponents, and everything in between. I recommend reading them all if you have the time. However, I have decided to go a different route. Since Alabama is going to be playing games on the road, I am going to provide to you a brief tour guide about those away game cities. I hope you find this helpful if you plan on attending any of these away games. Alabama’s first stop is Nashville, Tennessee (vs. Vanderbilt), the Music City. The first permanent community to settle in the Nashville area were a group of about two hundred settlers, led by James Robertson in 1779. They cleared the land and built a log stockade they called Fort Nashborough in honor of General Francis Nash. It was renamed Nashville in 1784 when it was incorporated as a town by the North Carolina legislature. The area was admitted to the Union as Tennessee soon after North Carolina ceded it to the federal government. It was selected as the permanent capital of Tennessee on October 7, 1843. One of the most popular shows in Nashville is the Grand Ole Opry. They used to play in Ryman Auditorium, but they moved to their new building on Opryland Drive. I cannot find any shows for the weekend of the game. Speaking of Opryland, the best hotel in Nashville is The Gaylord Opryland Resort and Hotel. It is HUGE and has a wide variety of places to eat, shop, and many different gardens to walk through. Staying there can get expensive, but it is a place you should at least walk through one day to see. Gaylord also owns the General Jackson Showboat. They have food and shows during the midday and nights while floating down the Cumberland River. CLICK HERE for menus. I saw a man named Tim Watson on that boat. He is goofier than most country singers, but he does play plenty of country classics with a band and a fiddle. Gaylord owns a lot of stuff in Nashville. One place I hope they don’t own (I think they do) is the Country Music Hall of Fame. I’m sure Hank is in there for those of you who are big fans. Tickets for adults are about $18. Having been to Nashville many times, I’ve eaten many different varieties of cuisine. One place I always want to go to if I am in the area is Demo’s Steak and Spaghetti on Commerce Street in Downtown Nashville. They serve one of the best steaks I’ve ever had with the added bonus of spaghetti on the side. That’s right, spaghetti. They have been full every night I’ve gone by, so I recommend getting there a little early for dinner. One place I’ve always wanted to see, but could never get to it in time, is Past Perfect. It is located on 3rd Avenue South. Every Friday and Saturday night they have live music. This place is pretty highly rated on every Nashville food guide I look at. Reservations are recommended on most of the sites, just to let you know. Many of their entrees are $13+, but I hear the atmosphere is great. There are plenty of places to check out in Downtown Nashville if you are looking for something different. I hope this was helpful for those who are going to Nashville. It is a fun town to visit (I’m worried about how I should do Starkville now). My next Bama Roadtrip city will be Jacksonville, Florida. We’ll be playing Florida State that weekend. Roll Tide!